Big Bags USA protective flood barriers simplistic design allows more systems to be deployed by fewer workers using less training and natural resources than sandbags. There are many protective flood barrier products on the market to stop, prevent and divert the flow of water and land containment. While many of these products work well, we feel it is best to identify any unique demands of the situation and consider cost, time, resources, length of deployment, clean-up cost, and finally the end use or reuse of your flood barrier product. 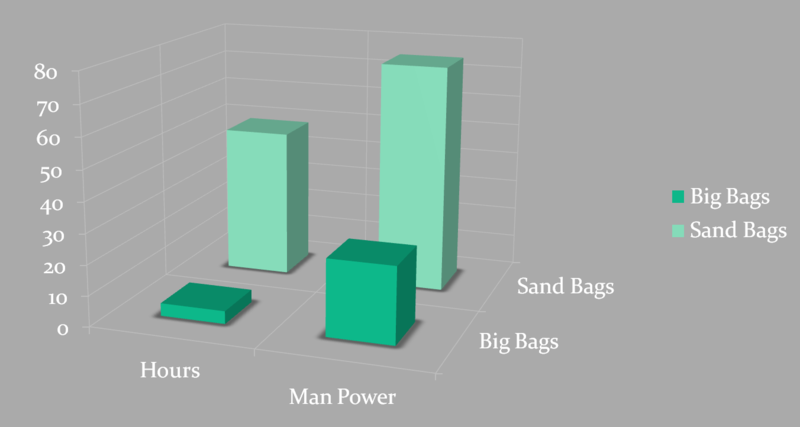 The benefits of using Big Bags USA sandbags barrier are many and varied. The most notable is price comparison. We offer the high quality Big Bags USA sandbags flood barrier at a great economic price with the most affordable price per linear foot. Another highly notable benefit to Big Bags USA sandbags protective flood barrier is the reduced amount of resources that are needed to deploy the systems. One Big Bags USA protective flood barrier system replaces 750 regular sandbags. This is just in the footprint! If you were to stack regular sandbags to meet 40” in height, it would equal to 1500 sandbags. By using the Big Bags USA systems you save 52% on the raw materials alone. Saving sand saves on operating costs, less freight and machine maintenance, less fuel cost and less labor all contributes to a better looking bottom line. In addition to your savings in deployment, Big Bags USA sandbags flood barrier offers more ways to save. The water side of the Big Bags USA protective flood barrier systems is impermeable; this means our sand is protected against harmful contaminants. Uncontaminated sand can be sold back to quarries at a reduced price or used in projects that would otherwise need new sand product. Big Bags USA sandbags systems are reusable and contain no harmful chemicals or materials giving them a low cost of reuse and disposal compared to other flood barriers. The town of Canton, Mo is surrounded by 3 miles of levees. In June of 2008, the predicted flood stage was 2 feet above the levee systems. Raise the top of levies 2 feet using a barrier of sandbags. 40,000 - 45,000 man hrs. $40,000 for lumber to backboard the sandbags. Culver college spent an estimated $950,000 on housing, food and other services. Project completion estimate 22 hrs. Canton, Mo could have saved $728,276 if they had used the Big Bags USA flood barrier system.